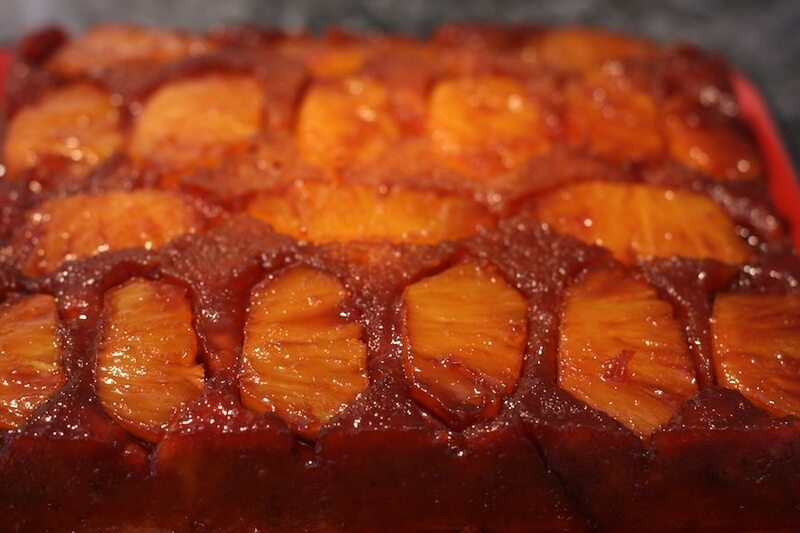 Something about Pineapple Upside Down Cake always rubbed me the wrong way. When I was a child, I didn’t understand what made it “upside down” and that bothered me. As a teenager, it seemed odd that the same combination of pineapple and maraschino cherries were also used as an adornment for ham and that bothered me. And as an adult, I took issue with the use of corn syrup-drenched canned pineapple and neon red (as seen from space) color of the cherries. It just seemed so unnatural. Thus here is my paradox. One of the major components to Pineapple Upside Down Cake was caramel. Caramel and I go way back, how could I possibly keep it out in the cold? Desperately determined to not judge a cake by it’s cover, it was time to soldier on and modify this cake using fresh ingredients, not canned ones that expire in 2025. Using fresh pineapple alone made the biggest difference and it only adds maybe 2 minutes to the prep time. 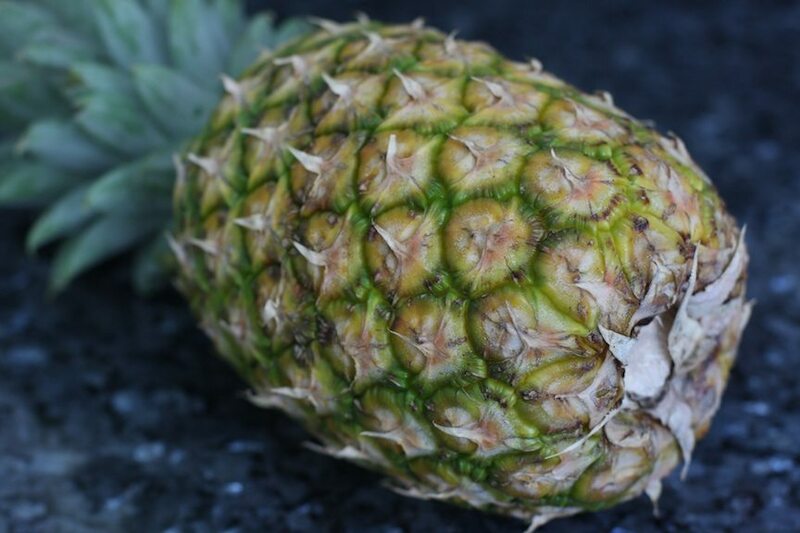 Fresh pineapple is sweet enough without the infusion of corn syrup – it’s just not needed. What else is different? A gooey homemade salted caramel creates the perfect bed for the sliced pineapple and bubbles up through the batter as the cake bakes live caramel lava. If that is not what sells you, then I don’t know what will. 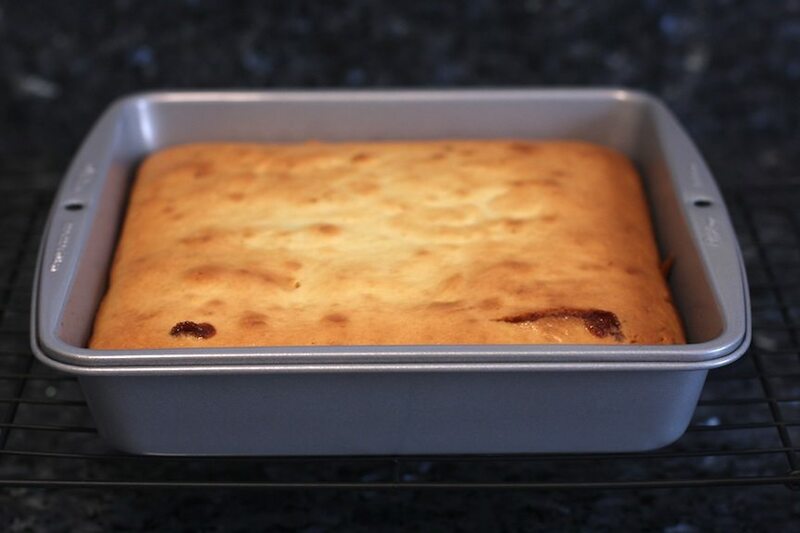 The cake itself is a moist French yogurt cake (I used Greek yogurt as I tend to break the law). As I’ve turned the other cheek today, I implore you to give Pineapple Upside Down (Yogurt) Cake a second chance. Preheat oven to 350F/180C. Grease a 9×9 square pan with the butter. Have the pineapple sliced and ready for when the caramel is done. For step-by-step pictures of how to clean a pineapple and make the cake, check out the Facebook page. Combine the sugar and water in a sauce pan with high sides. Gently stir to combine. Bring to a boil. Once boiling, stop stirring the sugar as this may cause the it to crystallize. When the sugar begins to caramelize, gently swirl the sugar around in the pot so that it will brown more evenly. Once the caramel has reached a medium amber, remove it from the heat and whisk in the butter. It WILL bubble up violently. Hense the need for a pot with high sides. Once the butter is in, whisk in the salt. Pour the caramel immediately into the bottom of your 9×9 pan. Sift together the flour, baking powder and salt in a small bowl. Don’t have a sifter? Use a whisk to mix and aerate the dry ingredients. In a large bowl, whisk together the eggs and sugar. Then add in the oil and yogurt and mix. Quickly whisk the dry into the yogurt mixture until just combined. There may be lumps, but that is no reason to get crazy. NOTE: The longer you whisk, the tougher the cake will be. Now that the caramel has cooled slightly, gently place the sliced pineapple on top of it in the pan. Try and get the pieces close together. Top with the batter and bake for 50-55m until cake springs back to touch. You’ll need to unmold the cake fairly quickly as the caramel will begin to harden with every passing moment it sits on the counter. Place your platter or plate upside down on top of the cake pan. Using pot holders or a towel to prevent burning your delicate hands, sandwich the plate to the pan and quickly flip them over so the cake drops onto the platter. Set both down on the counter before removing the pan from atop the cake to prevent scorching caramel from exploding all over your kitchen. Since we are on the subject of caramel, it seems like the perfect opportunity to surface what to do and what not to do when you get a burn from caramel or hot sugar. Sticking your finger, or hand, or elbow, or whatever has the hot sugar on it in your mouth. You’ll not only still have a burned finger, but you’ll also have a burned tongue. Trying to rip or peel the sugar off your skin while it’s hot. It will take your skin with it. Touching hot sugar. Sugar caramelizes at 350F! Run your finger, or hand, or elbow under cold running water until the sugar has completely cooled down and hardened. Only then can you peel it off. Treat it like any other burn when letting it heal. Learn from your burn. Believe me, that first caramel burn should be your last. Safety first!